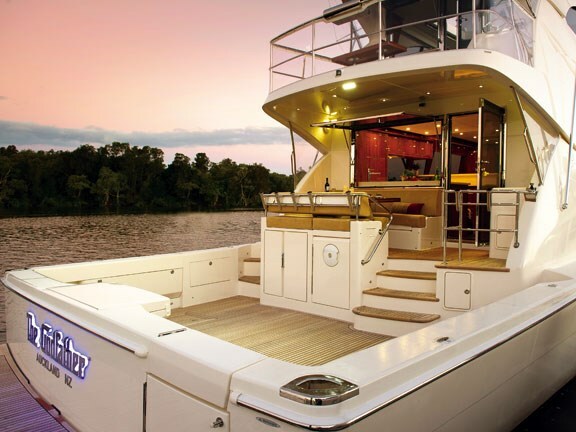 For over 20 years, Riviera’s Coomera-based yard has set the standard for production boat building in Australia. But it stretches boundaries to describe the new Riviera 75 Flybridge as a production boat. Like the previous five-or-so 70-foot vessels out of the Riviera stable, the 75 project was managed from start-to-finish by a single shipwright. Career boat builder Paul Wrench's obsession with creating the best possible vessels within the scope of his resources is apparent to anyone engaged in conversation with him. His focus and attention to detail is much like that you would experience from a professional sportsman. There is passion in his presence and it is expressed in the boats that he builds. Officially unveiled at the Australian Sanctuary Cove Boat Show, the 75 Flybridge is the largest hull ever produced at the Riviera yard and I felt privileged to be offered a pre-launch trial of this magnitude. Although we have tested the hull's predecessor, the Riviera 70 Enclosed Flybridge, this vessel is more than just an extension of the mould. It was important to see firsthand the features that set this boat apart from its peers. As it happens, there is a Riviera 75 in Exmouth, Western Australia. Originally a Riviera 70, the extra five feet was added to the cockpit post-production, whereas the new 75 was built from a brand-new mould. If we understand Riviera correctly, the 70 has reached the end of its production run and has been replaced with the new Riviera 75. The Godfather is an appropriate name for an impressive boat, but it is not the first Riviera with this name. It is the owner's third Riviera, following a 48 Flybridge and a 60 Flybridge. At an age when many dedicated sefarers look to downsize, this adventurous couple have plans to range further than ever before and this is what makes this new Riviera 75 Flybridge particularly interesting. Clearly a vessel of this size and complexity has the potential to be a monumental nightmare in the wrong hands. One has to ask if it is reasonable to expect recreational boaters - even highly experienced ones as these are - to come to terms with the vast array of electronic systems and the intimidating inertia produced by 3600hp, pushing 52 tonnes of gleaming gelcoat and sparkling stainless steel. This was the question posed to Riviera as part of the original brief. The answer, it believed, would come from a rare combination of brawn and brains. The execution would require a conversation with two well-trusted suppliers, Twin Disc and BEP Marine. For many years as a professional skipper and more recently as a marine writer, I have been outspoken about the direction marine technology is moving in. As consumers demand greater functionality and performance from their boats, the complexity of systems has tended to become increasingly unmanageable. To my mind, many on-board systems have become so convoluted that they are more of a hindrance than a help. From my own experience, I began to notice that the turnaround time between trips became a race to fix an endless array of problems. Leading electrical design company BEP Marine, also aware of these issues, has toiled diligently behind the scenes to develop a user-friendly solution that it calls C-Zone. By aiming to deliver on what it views as the four cornerstones of its development philosophy – bulletproof reliability, scalability, ease of installation and reduced complexity – great progress has been made over time. In summary, today's iteration of C-Zone is a centralised digital switching and monitoring system that is NMEA 2000-compliant and runs every facet of a vessel's electrical system via a single network cable backbone. The product is vastly customisable and has a high level of built-in redundancy by virtue of multiple independent hard drives - any one of which is capable of running the boat's entire system on its own. A selection of modes is developed in consultation with the owner to suit the various modes that the vessel is likely to be used in. With options like Quiet Ship, Fishing, Night-Running and Entertainment to choose from, a unique configuration can be selected at the touch of a button. While not yet as intuitive as an iPad, the system shares similarities with Apple touchscreen functionality and the system's user-friendliness is improving with every new generation. If BEP Marine's C-Zone has delivered the brains, then industry-leading transmission manufacturer Twin Disc has most certainly provided the muscle. Where many would find managing a craft of this size (almost 25m long and displacing 42 tonnes dry) - a daunting prospect even if fully-crewed - two can easily handle The Godfather. So how is this extraordinary handling capability achieved? Well it's not by pod drives, that's for certain. Twin Disc's contender in the joystick control market, dubbed EJS, delivers the muscle behind the smarts. When many other transmission manufacturers raced to develop a pod or stern-drive joystick control system, Twin Disc took its time and watched the space develop before investing in what is known as the Twin Disc Express Joystick System. Recognising that many life-long boaters are diehard shaft drive fans with good reason, Twin Disc opted to stick with the simplicity and proven reliability of conventional shaft drives. The company's Quick-Shift electronic transmission system has a huge fanbase and reputation for unequalled performance. It's utilised as the foundation for the new system – if it ain't broke, why fix it? This allows for the use of bigger horsepower powerplants than are currently available through other pod systems. On The Godfather, a pair of 1800 hp C32 Acert Cats combine with twin 45hp hydraulic bow and stern thrusters. Hydraulic thrusters allow for continuous operation where electric thrusters do not – and all tied together by a single joystick. As with most drive systems, multiple modes are available to the operator. The boat can be controlled conventionally through the twin EC300 electronic lever control in a variety of speed modes, or via the joystick docking or slow-speed maneuvering. The real beauty of the EJS system is that it delivers very real power in a completely intuitive manner by virtue of a series of seamless actuators. I have heard anecdotally that Twin Disc use phrases like 'cradling a baby bird' in its instructions, but such care really isn't necessary. Take it from me, we crushed the baby bird and if you want to get angry you can throw this boat around like a kid's toy on the joystick controller alone. 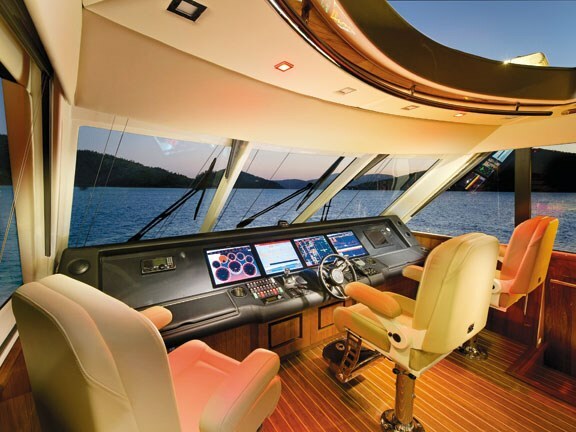 Naturally there is more to the Riviera 75 Enclosed Flybridge than a clever brain and an excellent piloting system. Like all vessels from Riviera, this boat is beautifully finished and laid out with the ultimate offshore cruising lifestyle in mind. Although we reviewed a very similar model in its predecessor, the Riviera 70, it is worth a quick stroll through a few features of particular note. For those yet to experience the jaw-dropping opulence of a full beam master cabin, the 75 delivers one of the finest examples on offer. 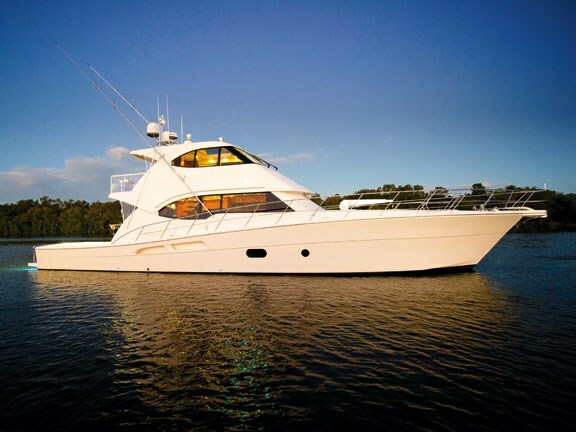 This cabin style has become a 'must have' in a recreational cruising vessel. Who would have thought a boat built to be handled by two could feature a bedroom with the king-size bed, dual walk-in wardrobes, a couch, a make-up cabinet and an en suite large enough to host company? There can be few experiences in life better than waking up in that sumptuous cabin, throwing on a robe and lazily wandering up to the smell of fresh coffee wafting from the expansive aft galley, opened fully to make the most of an idyllic island anchorage. Moving the galley aft has allowed the designers to reconfigure the saloon. The formal dining table on the 70 has gone and in its place is a more relaxed and spacious layout to accommodate at least 10 guests. It should come as no surprise that the cockpit of the 75, with its excellent mezzanine floor for al-fresco dining, is the largest in its class. The extra five feet make all the difference here, although during the sea trial it was fairly bare, other than the custom refrigeration and outdoor cooking facilities. I look forward to seeing it in all its glory after a full makeover with long-range fishing in mind as part. I guess it is fair to say that when you have size, you have options. From a servicing point of view, The Godfather is hard to beat. Everywhere you look - on the bridge under the dash, behind the appliances and television sets - there is ample space to work. I spent an embarrassing amount of time soaking in the detail in the engine room, (accessed from the cockpit via a multipoint sealing sea-door), and in the completely separate utilities room with its dedicated ladder-serviced hatch in the forward hallway. It's a joy to see systems like the watermaker and the pumping mechanisms given plenty of separation to ensure routine servicing, is as straightforward and gentle on the body as possible. Full marks to the designer in this aspect. It would be difficult to ask for better a sea trial than the one we completed from the Gold Coast to the tip of Moreton Island and back. It is hard not to be impressed by a 52-tonne vessel cruising at a truly sea-cleaving 24 knots, with only 60 per cent engine load and a total fuel consumption of 400LPH registering on the integrated display. To put that into perspective, at that speed The Godfather has a cruising range of more than 600 nautical miles. Slow to 10 knots and the range increases to somewhere between 2000 to 2500 nautical miles. This is a vessel genuinely capable of roaming the Pacific, almost at will. Suddenly, all those expeditions you always dreamed of are within reach. There are no unpleasant surprises out of the Riviera yard. 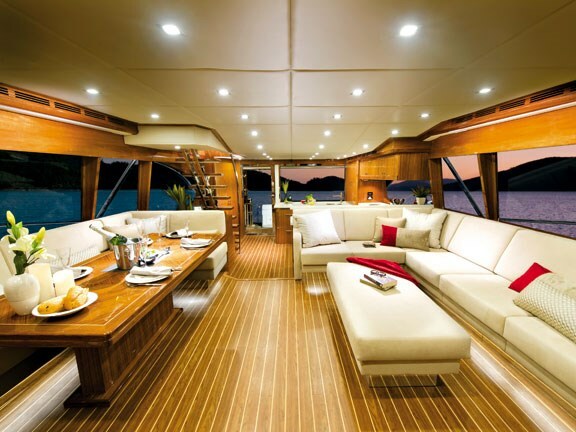 The company has reinforced its reputation through the toughest of times as a builder of top-quality production boats. And in circumstances where many would have looked at major overhead reductions in aftermarket service, the business has recognised the value of long-term relationships and has built up a level of customer loyalty that is the envy of all. 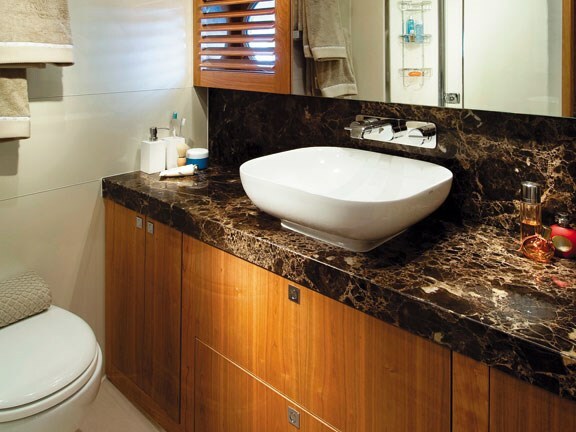 While the vessel is as refined in its detailing as it is impressive in stature, these factors are not where the X factor lies. For me it is the simplicity of ownership that sets this vessel apart. That unique combination of brains and brawn, C-Zone and Twin Disc EJS, is the quality sure to get the attention of a boating public keen for grander adventures independent of a professional crew. In this vessel, Riviera has blurred the line between a live-aboard boat capable of extended cruising and serious expedition vessel requiring a complement of experienced crew. I suspect the company has hit a bulls-eye in a local market full of highly capable recreational boaters looking for an opportunity to take the next step. It will be interesting to see if it strikes a chord in New Zealand and other overseas markets. Our test boat was supplied by Riviera Boats, Coomera, Gold Coast, Queensland, riviera.com.au.